How many students are in our group classes? What is the appropriate age to learn how to shoot? Are there any mental / physical requirements when learning to shoot? Is it normal to feel uneasy, apprehensive or a little afraid about learning to shoot a gun? You don’t own a pistol – should you buy one first? Do we teach CCW Courses? What should you do when you ARRIVE? We offer pistol classes for women (and men) of all skill levels. Our Group Classes are for women only. We schedule private training for men, couples, families and company outings. 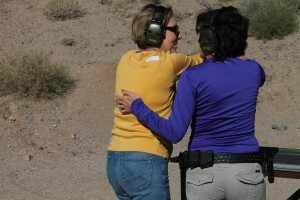 The Basic 101 group class is for any woman who is brand new to shooting. It is also for those women who haven’t shot in a while and want to brush up / review gun safety and proper shooting techniques. If you already have pistol experience and need more-advanced instruction, we also schedule private sessions and can cater them to your specific needs; whether you want to improve your accuracy or speed, learn to draw from a holster, or you want to get started in pistol competitions. If you are considering taking a CCW (concealed carry weapons) course, take our class first. We teach the basic pistol safety and shooting skills that you will need for the live fire portion of the CCW course. A CCW course will not teach you how to shoot. We allow a maximum of 8 students. Once we begin the live fire session, each instructor typically has no more than 2 students shooting at a time. Students may attend our classes once they have reached 18 years of age. Minor Policy: We may allow minors, based on their experience and maturity level. Not all children are ready to learn about firearms and firearm safety at a predetermined age. Parents must also attend class with their minor child. We suggest scheduling a private session in this situation. Please contact us to arrange. We do not have an upper age limit, and we have taught a variety of women in their senior years. Shooting is a skill though that demands a certain amount of physical stamina and strength. Please read about physical requirements below. Are there any mental / physical requirements when learning how to shoot a pistol? Shooting is a skill that demands clear judgement and a certain amount of physical stamina and strength. You have NO physical, mental and/or medical condition(s) that may interfere with your strength, stamina or impair your judgement. * We require you to be in complete emotional / mental control to attend any class or practice session.We absolutely cannot allow any student with any form of mental illness and/or drug addiction/use problem that would prohibit them from legally and/or safely possessing and using a firearm. You can stand / shoot for 2 -3 hours without a long break. Note that we shoot outside also. Your hands and arms are physically strong enough to hold and safely operate a pistol (load & unload; rack the slide & lock the slide open). If you have strength / physical limitations, please contact us for a PRIVATE session. *HerHandgun reserves the right to deny participation to or remove from class any individual based on any condition or circumstance that may possibly create an unsafe environment or situation. We offer pistols to rent ($20) if you want to “try before you buy” – we highly recommend this. Some gun shops with ranges may also rent pistols. Is it normal to feel uneasy, apprehensive or a little nervous about learning to shoot a gun? Yes – Many of our students who have never shot a gun before feel this way! You are not alone. Unfortunately, most women are not taught about guns, shooting or hunting during their lifetime. But don’t worry – you are in good hands. Our safe, informative, hands on approach will take all of the mystery out of your handgun and how to shoot. Knowledge is power! SAFETY is our number one priority in all of our low-key, supportive training sessions. We start our safety discussion with “blue guns”, which are plastic models of a pistol. You have hands on time with the blue guns before we move to dry fire and live fire. We discuss the terminology related to pistols so you understand the parts of a handgun. We also explain how a pistol works in an effort to take away the mystery. We want you to be comfortable with and understand how your gun works. Next we begin teaching the proper techniques required to safely and accurately shoot a pistol. We then get to the shooting part. 🙂 And we never allow a new shooter to fire a shot unless they are absolutely ready. To date, we have taught hundreds upon hundreds of women how to shoot. 99+ percent of them leave with a smile, feeling empowered, knowledgeable and much more confident and accurate with their gun! Shooting is not for everyone though. A very small number of our students (we have had only 2 since we began teaching in 2007) are not able to complete the class. For various reasons, shooting was not something they could do. Do we teach CCW (Concealed Carry Weapons) Courses? Everything you learn in our Basic 101 Class will compliment the CCW course. If you are considering taking a state CCW course, take our class first. We teach the basic pistol safety and shooting skills that you will need for the live fire portion of the CCW course. A CCW course does NOT teach you how to shoot. 100 rounds of factory ammunition (in the caliber of your handgun) – Ammunition may be brought in a separate bag in its factory container. Protective glasses – clear glasses if an evening class. Sunglasses and/or prescription glasses are fine if they completely cover the eye and immediate area around the eyes. Small lensed glasses do not provide ample coverage. Ideally, your glasses should meet or exceed the “ANSI Z87.1-2010″ standard. Ear Muffs and/or Ear Plugs – We have a limited number of ear muffs to loan. Jacket and/or layering in cooler months – the classes are outside. We hold all of our classes outdoors at Usery Mountain Shooting Range / Rio Salado Sportsman’s Club. The range is in NE Mesa. Please reference our RANGE page for more info. Print the detailed directions and MAP of the range that we emailed. This will help you locate us. Our range is quite sizable and we have many shooting locations. Park by the shotgun area. We will be in one of the two Training Bays to the north. When you get out of your car, you must have your protective glasses on, as the range has ongoing shooting activities. Do NOT handle firearms in the car / parking lot. Keep all firearms enclosed in their bags / cases until you have arrived at the class. You will only handle your gun under the supervision of an instructor. Bring your gun bag, ammo, magazines, water and anything else you need. Lock your car. Absolutely no alcohol or drugs are allowed in you or on you while at the range.